Kazakhstan prepaid sim card pay-as-you-go - beachSIM.com - prepaid. mobile internet. abroad. Kazakhstan prepaid sim card pay-as-you-go with 10 Euro starting credit. Receive calls and texts in Kazakhstan and cheap rates for active calls, texts, data. With this Kazakhstan prepaid sim card pay-as-you-go you can be called and texted in Kazakhstan. 10 Euro starting credit for calls, texts, or data. These services cost (see rates below) and are deducted from the starting credit balance. 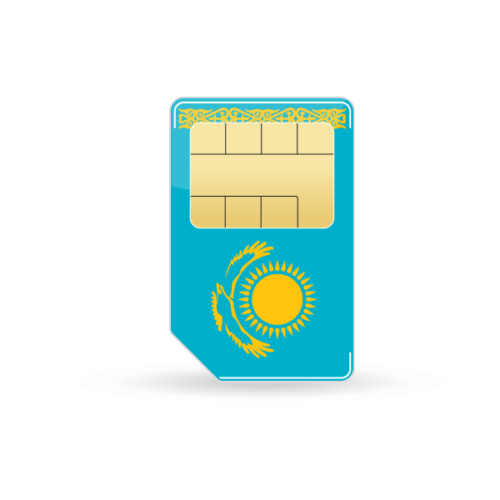 This Kazakhstan pay-as-you-go sim card has a good coverage in Kazakhstan and uses the network of Kazakhtelecom. You have 10 Euro starting credit on your Kazakhstan prepaid sim card pay-as-you-go. You can refill your balance any time online, e.g. before your departure or during your trip abroad – detailed manual comes with the Kazakhstan sim card. Besides Kazakhstan, this sim card is useful in all countries abroad. You can use it in all countries, and rates are usually much cheaper than your home mobile contract. In 95 countries you can receive calls and texts for free. Rates different per country. We wish a an eventful and successful trip to Kazakhstan with this Kazakhstan pay-as-you-go sim card!